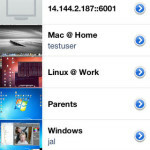 Control a computer from your iPhone, iPad or iPod touch! 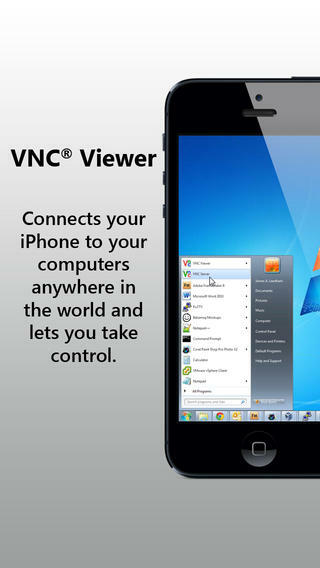 VNC® Viewer connects your device to a computer anywhere in the world, displays its desktop, and lets you take control. You can run applications, change settings, and access data exactly as you would be permitted to do were you sitting in front of that computer, and using its keyboard and mouse. 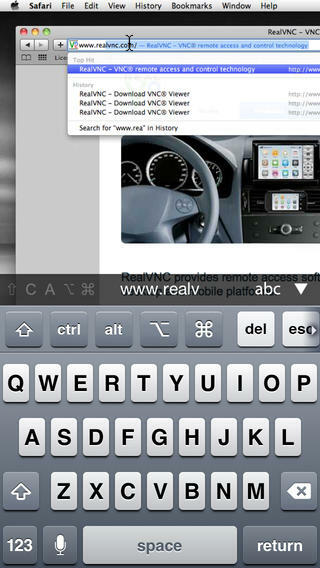 VNC Viewer is from RealVNC, the inventor of VNC technology. It can connect to any Mac OS X, Windows, Linux, or UNIX computer running VNC-compatible Server technology. RealVNC recommends VNC 5 for robust, secure, and high-performance connections, and for its unrivalled flexibility; free and trial licenses are available. For more information, visit www.realvnc.com. 1. 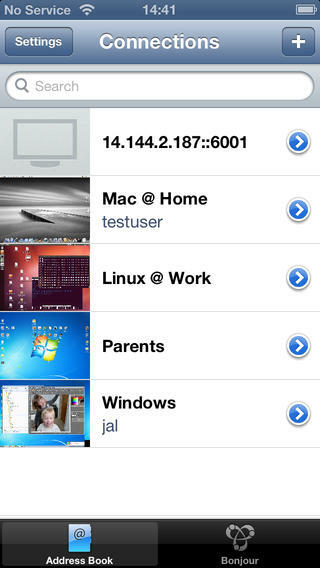 Download VNC Viewer from the App Store. 2. Obtain and start VNC-compatible Server technology for the computer you want to control, for example VNC 5. 3. If you are connecting over the Internet (for example, via 3G), configure firewalls and routers protecting the computer to allow and forward network communications to it. 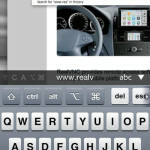 Start with www.realvnc.com/products/ios/2.1 for more information. If you are connecting over a Wi-Fi-enabled private network such as a LAN or VPN, you should be able to connect straight away. 4. Find out the network address of the computer. If you are connecting over the Internet, this will probably be that of a router. You will also need a port number if the VNC-compatible Server is listening on a port other than the default for VNC, 5900. 5. Start VNC Viewer, identify the computer you want to control, and connect! * Interact with your computer as though sitting in front of it. * Support for Bonjour, making it simple to locate and connect to compatible computers. * Give connections user-friendly names, and see desktop previews. * Pinch to zoom in to a specific area, or out to see the whole picture. 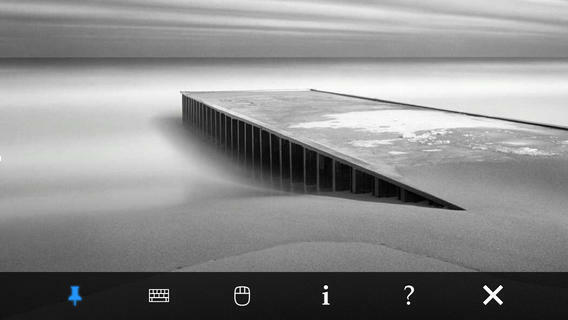 * Easy navigation, scrolling, dragging, and selection using standard touch, tap, and drag gestures. * Mouse button mode for precise control over mouse button and scrolling operations. 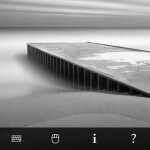 * Easy text entry using on-screen keyboard with preview. * Important non-character keyboard keys (function, modifier, and so on) available on a scrolling key bar. * Support for screen resolutions up to 5120 by 2400 pixels (though the actual resolution is limited only by the memory of your device). * Connections encrypted using up to 256-bit AES technology. * Authentication credentials protected by 2048-bit RSA public keys. * System authentication to connect using computer log on credentials. * Support for non-US keyboards. * Text transfer between applications on computer and device. VNC 5 is available for a wide range of Mac OS X, Windows, Linux, and UNIX computers. For more information, visit www.realvnc.com/products/vnc. * VNC 5.x with a Free license, from RealVNC. * Mac OS X 10.4 or later with built-in Apple Remote Desktop/Screen Sharing enabled (System Preferences > Sharing). Note this does not apply to PowerPC Macs running 10.4 (Tiger); install VNC-compatible Server technology instead. * VNC 5.x with a Personal or an Enterprise license, from RealVNC. 30 day trials are available. * Legacy VNC Enterprise Edition 4.x, from RealVNC. * Legacy VNC Personal Edition 4.x, from RealVNC. Follow us on Twitter for the latest news @realvnc. 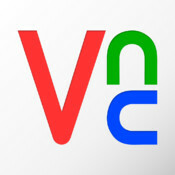 VNC is a registered trademark of RealVNC Ltd. in the U.S. and in other countries. Protected by UK patent 2481870.